Heidelberg Engineering Announces the CE-Marking of ANTERION | Heidelberg Engineering Ltd.
Heidelberg, Germany – Heidelberg Engineering, the leader in diagnostic imaging known for the internationally-acclaimed SPECTRALIS® retina and glaucoma platform, announces the CE-marking of ANTERION® – an innovative platform designed to transform anterior segment diagnostics and workflow. The new ANTERION provides the most important anterior segment examinations and measurements in one modular, upgradeable platform. It is a single, workflow-efficient solution that brings together corneal topography and tomography, anterior segment metrics, axial length measurement and IOL calculation to transform the day-to-day routine of busy practices and clinics. Heidelberg Engineering has leveraged its core OCT technologies in the development of the ANTERION, making the best use not only of swept-source OCT but also of patented tracking and composite imaging technologies to deliver exceptionally high-quality images of the anterior segment. Visual confirmation of all measurements with high-resolution swept-source OCT images establishes a new level of diagnostic confidence. 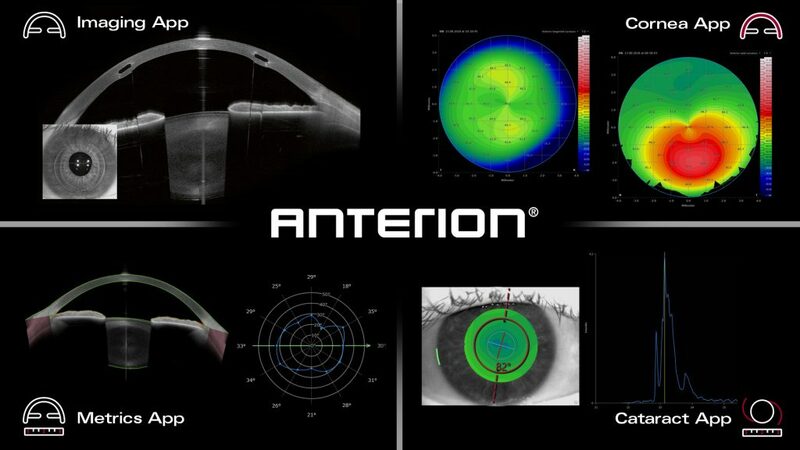 As the foundation of the ANTERION platform, the Imaging App focuses on the high-resolution visualization of the entire anterior segment, from the anterior surface of the cornea to the posterior surface of the lens. The other ANTERION Apps adjust to various clinical needs. The Cornea App provides a comprehensive diagnostic solution to assess a patient’s individual corneal geometry. Corneal alterations can be diagnosed and monitored and the planning and evaluation of refractive surgery enhanced. The Cataract App combines key measurements for cataract surgery planning: corneal analysis, anterior chamber depth, lens thickness, and axial length. The ability to assess total corneal power supports a more suitable IOL selection, while the integrated spheric and toric IOL calculator adds convenience to the pre-operative routine. The Metrics App features swept-source OCT images with the anterior chamber displayed in a radial view. Predefined angle parameters can be determined and free-hand measurements can also be performed. Heidelberg Engineering has optimized swept-source OCT technology for anterior segment imaging on the new ANTERION and will continue to innovate with spectral domain OCT retinal imaging on the SPECTRALIS. Both imaging platforms aim to deliver the highest-quality images that empower eye care professionals to make confident diagnostic decisions that ultimately improve patient care. The new Heidelberg Engineering ANTERION® provides the most important anterior segment examinations and measurements in one modular, upgradeable platform.